A pimple is a popular skin condition that influences many people. It is an inflammation of your skin. It makes the sebaceous glands be infected with bacteria and fill with pus. 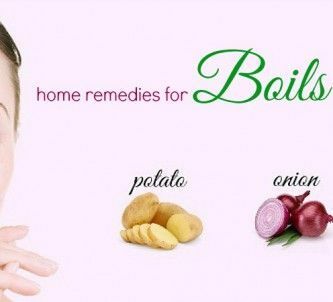 There are many ways of healing pimples at home by using vegetables, fruits and many more. 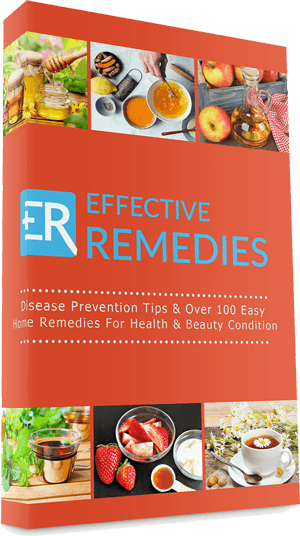 In this article, EffectiveRemedies.com will show you 36 most effective home remedies for pimples on scalp, face, and back that work naturally. The following writing collected information from reliable sources. However, it is not intended to give medical advice. Keep reading this writing to understand more! As we know, lemon is a natural bleacher. Moreover, it also contains antimicrobial properties that help to kill bacteria causing pimples and acne . But do you know lemon is also one of the most effective home remedies for pimples? 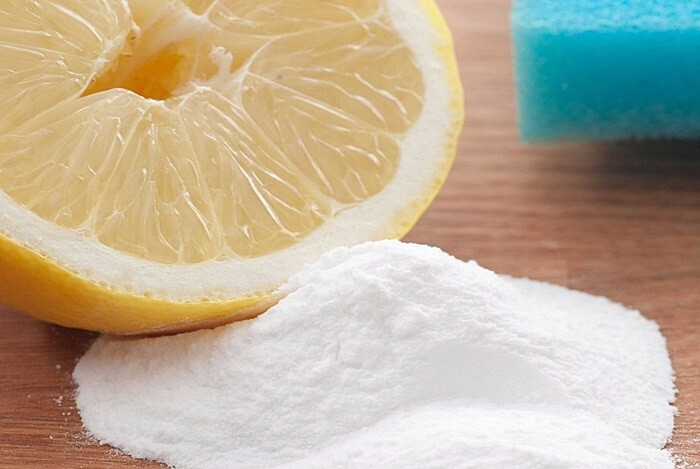 Yes, you can combine or mix lemon with many other ingredients to eliminate those pimples. 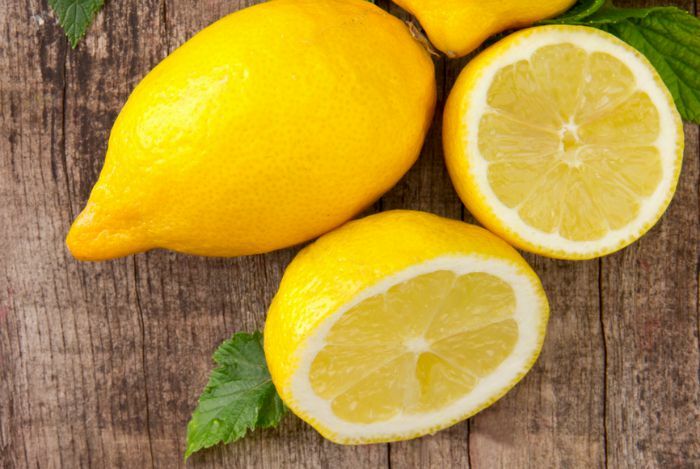 Here are some remedies that you can do with lemon to eliminate pimples. This combination may be the easiest home treatment for pimples. You just mix 1 tablespoon of lime juice with 1 tablespoon of groundnut oil. Then you apply this mixture on your face. This remedy can help in preventing blackheads which are the foundations for pimples! First of all, you get a mixture by mixing lime juice and rose water at an equal ratio. Next, you apply it on your pimples. You allow it to be on there for about 30 minutes. Then you rinse it off with clean water. 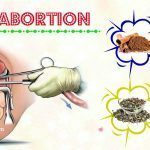 It’s very simple to do but you should remember to apply this remedy daily during 2 to 4 weeks depending on your condition. 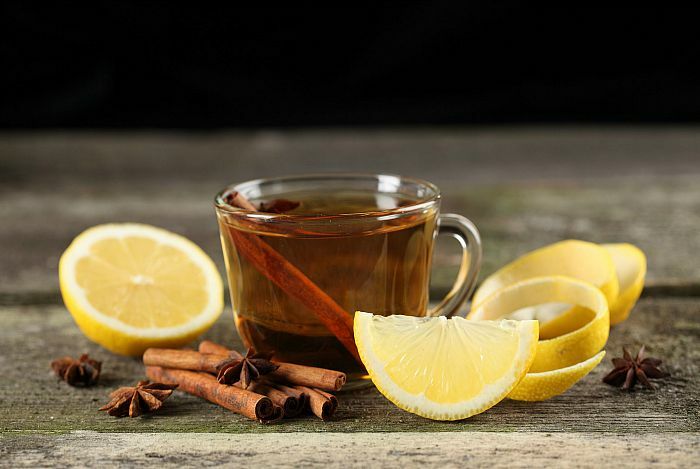 The combination of lemon with cinnamon and sandalwood powder is a great way to get rid of pimples! You just mix 1 teaspoon of cinnamon powder, 1 teaspoon of sandalwood powder with some drops of lime juice to get a fine paste. Then you apply this paste on pimples as same as you did in remedy 2. You should apply it daily and after 2 to 4 weeks, you will see the improvements. 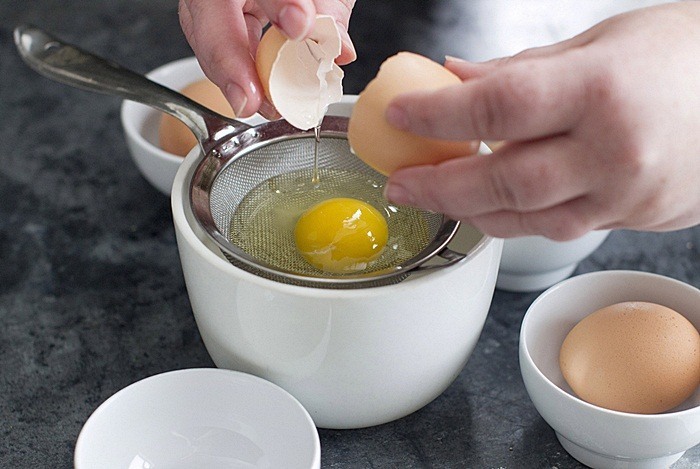 Applying a combination of egg whites and lime juice is beneficial for treating pimples. You just apply a little fresh lime juice on the pimples. Then you dab a little egg white on there. You let it be there for about 30 minutes. Now you wash it off with clean water. You should try this process daily to get relief from pimples on your face. The toothpaste is not only used to brush teeth, but also to cure pimples fast. Because certain types of toothpastes have menthol or another kind of cooling compound, it’s usually used to heal swollen areas. 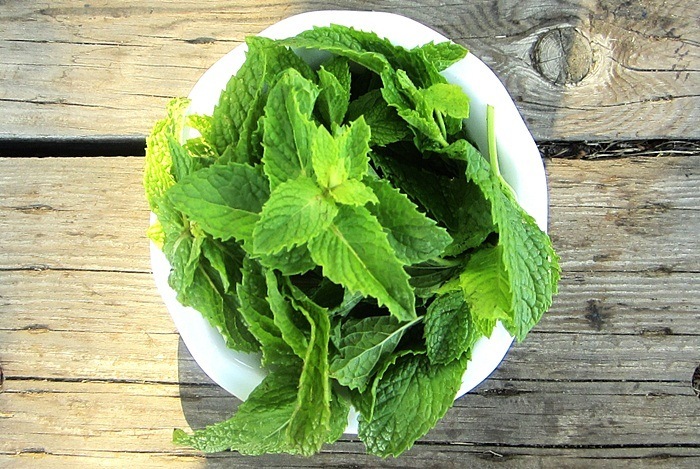 According to a study of “Menthol & Related Cooling Compounds” in The Journal of the Pharmacy & Pharmacology, menthol can help to reduce swelling & enhance cold-receptor activity. This means that the same ingredient which leaves you with a clean & fresh taste in the mouth works as ice on pimples. 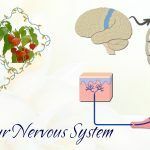 Within minutes, inflammation & swelling may be significantly reduced . It is the best when you use it after applying the ice remedy. You have to use white toothpaste and avoid applying gel toothpaste. First of all, you apply a little white toothpaste on your affected skin area before you go to bed. In the next morning, you wash your face with clean water. Keep applying this process and you can eliminate the swelling & pimples. Garlic is known as one of the natural remedies for pimples due to its antibacterial, anti-inflammatory, & antimicrobial properties. 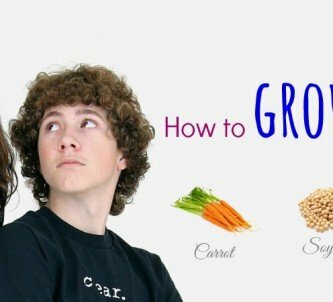 Because acne results from clogged pores, over-accumulation of toxins, & bacterial infections, you can use garlic to reduce acne . You can either consume it or use it topically to help in reducing the severity of your pimples and prevent them from recurring in the future. 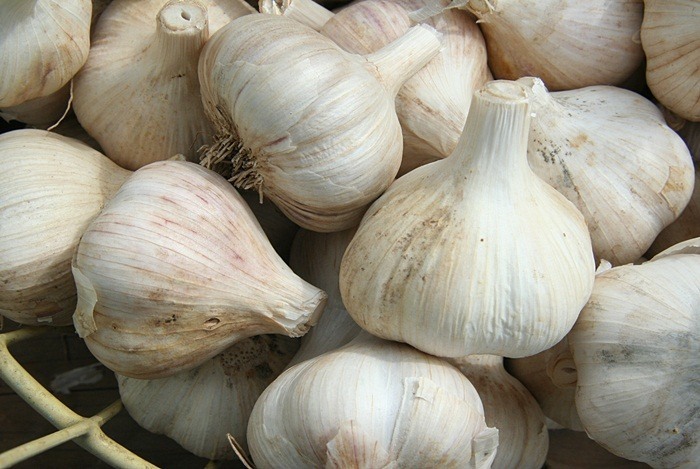 Extracting the garlic to get its juice to drink is a great way to treat pimples. However, if you cannot take its juices, you can mash it up and put it in a little water to drink. Firstly, you extract the garlic juice or you mash up 2 to 3 cloves and soak it in water for 10 minutes to get the garlic water. Using a cotton pad and soak it in the juice of the garlic. Do it daily to get rid of pimples quickly. If you choose to eat garlic, you should eat only 1 to 2 cloves a day. There are many home remedies for pimples, keep following this article to have more information! Honey is known as a source of natural antibiotics which may stimulate the healing process and help in preventing infections. It contains antibacterial effects. According to a 2013 study, honey controls the P.acne bacteria thanks to its follicular microenvironment . Propionibacterium causes the bacterial action in your clogged pores, resulting in inflammation. Honey also contains anti-inflammatory effects that reduce the swelling & redness caused due to pimples. In a 2011 study, honey contains anti-inflammatory effects in the chronic inflammatory conditions . Moreover, the osmotic effect in honey absorbs water in your wounds and releases hydrogen peroxide, which is a great antiseptic to kill bacteria and clear pimples . First of all, you soak a clean cotton swab to honey. Then you put it directly on your affected area. Next, you let it be in your affected area for about half an hour. You rinse your skin well with warm water. You should do this process a few times per day to get the best results. 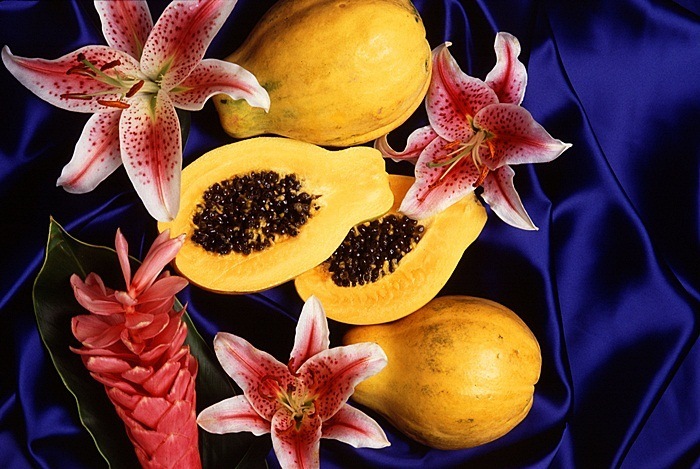 Papaya is a vital ingredient in many beauty products that you can find on the market nowadays. However, it is not necessary for you to go out to gain its interests? 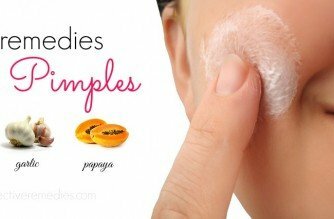 Using plain raw papaya is one of the home remedies for pimples. It can help you in removing dead skin cells & excess lipids from your skin. Therefore, it makes your skin become soft and smooth. 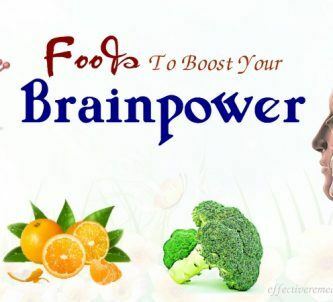 Moreover, papaya also has an enzyme which is called papain. This kind of enzyme can help in reducing inflammation and preventing the pus from forming. Moreover, many studies suggest that papain in papaya can be used as a remedy for wounds, skin ulcers, and other skin-related conditions. For example, according to an animal study in 2010, a papain-based cleanser for wound helped to promote the wound healing process in rats . In a systematic review in 2012, papain is safe & effective in treating many kinds of wounds in stages of healing . Firstly, you wash your face with clean water and pat dry. Secondly, you take the flesh of the papaya and then crush it well until it is a fine paste so that you can easily apply to your skin. Next, you allow it to stay on your face for 15 to 20 minutes. Finally, you wash off completely with lukewarm water. 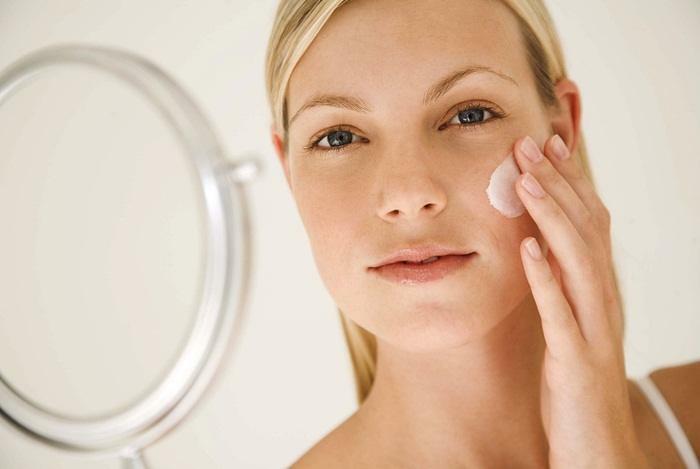 If your skin becomes dry after you clean it, you should use a suitable moisturizer cream for your skin after that. 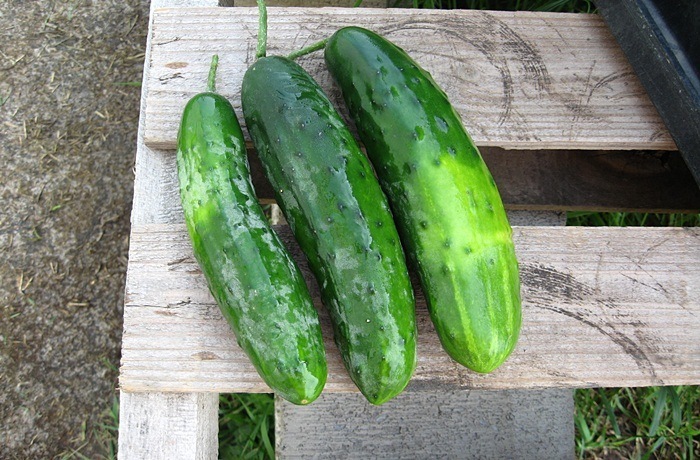 Cucumber has a large number of vitamins such as A, C, E, and potassium. It is also beneficial for soothing and cooling & healing pimples on your face . Here are some home remedies for pimples by using cucumber that you may try. First of all, you slice 1 or 2 fresh cucumbers into many pieces. Then you dip them into the water for an hour. In this time, the nutrients, such as potassium, chlorophyll, and vitamin A can transfer to the water. Next, you strain the water and then you drink or use this water to rinse your face. You can make a face mask by crushing 1 cucumber. Then you apply this mask on face and wait for about 15 minutes in order to let it dry. Finally, you rinse your face with lukewarm water. This process will help you in cleaning bacteria and dirt from your pores. Baking soda is one of the effective home remedies for pimples. It helps in exfoliating your skin to eliminate excess oil, dead skin cells, and dirt. Baking soda may also reduce infection & redness in pimples. For example, in a 1997 study, baking soda contains antibacterial properties . A baking soda paste helps treat acne & pimples by drying excess oil. Although baking soda is alkaline in nature, it may neutralize and balance pH on the skin. As you may know, this is very important in treating acne and pimples because acne/pimples can cause your skin to get more acidic. According to a study in the journal of Annals Dermatology, pH levels on your skin are affected by the sebum secretions & the presence of acne . Then, you clean your skin and allow it to be wet slightly. Next, you rub the paste gently on your affected areas and let it dry for about 5 minutes. Remember not to allow the baking soda to stay on your skin more than 5 minutes because it can lead to dryness or irritation. Finally, you rinse your face with lukewarm water. Keep repeating this process 2 times a day to get the improvements quickly. 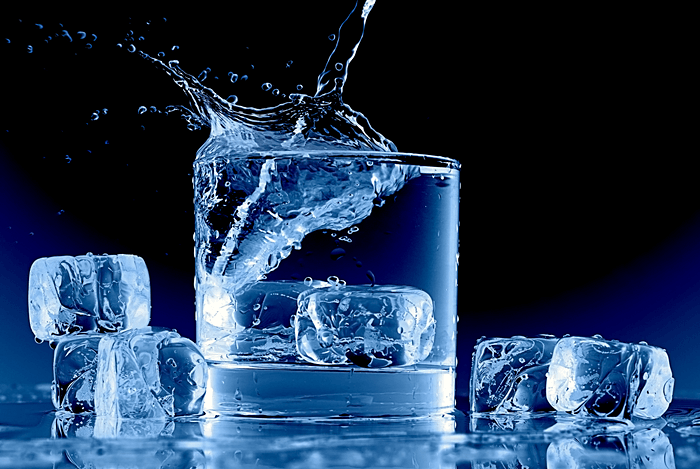 Ice is beneficial in reducing the redness, swelling, and inflammation of pimples quickly. Hence, it is used as one of the home remedies for pimples. It can help you to promote blood circulation to the affected area and tighten your skin pores and cleanse the skin area where contained dirt and oil. In addition, you can apply ice cubes or crushed ice, whichever you feel convenient. Firstly, you wrap the ice in a clean cloth. Then you apply it to your affected skin area for a few seconds. You should repeat this process after a few minutes and keep doing it many times a day to get rid of pimples. 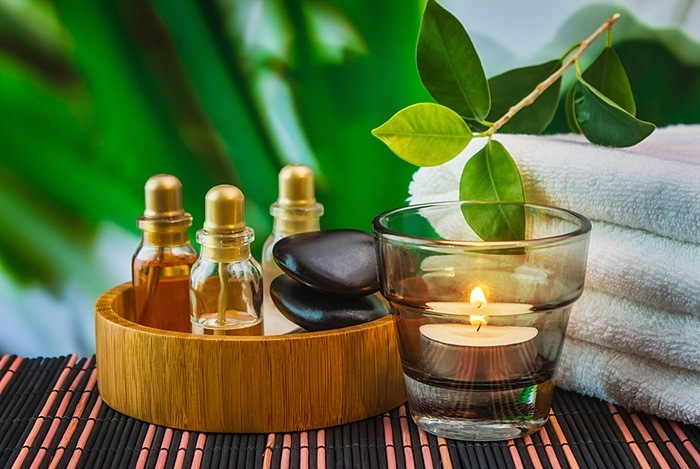 You may know about the effect of tea tree oil https://effectiveremedies.com/benefits-of-tea-tree-oil/ on many home remedies, however, almost you will see that it is mentioned most in treating skin diseases, specifically pimples. Tea tree oil is not similar to the oil that your skin produces naturally. It seems to be known as a solvent which can reduce the extra sebum, dead skin cells and unblock your pores. Its antibacterial properties that may prevent further outbreaks will have the ability to eliminate bacteria causing the pimples . Moreover, in one study in the Indian Journal of Dermatology, Venereology and Leprology, tea tree oil may effectively cure acne vulgaris . Note: You should not swallow it. In addition, you should combine it with water before using. A small bottle of tea tree oil. First of all, you wash your face with water and pat dry. Next, you mix tea tree oil with water at a ratio of 1:9. Then you dip a cotton ball/clean cloth into the mixture and apply it to your problem areas. If you want to get a dilution more strongly, you should begin to raise the strength slowly after a while. You have to make sure that you apply a new mixture at least for a week in order to make it stronger. You may use a light moisturizer afterward if you want. Especially if your face skin is sensitive, remember to combine it with aloe vera gel to replace water. Keep reading this writing about home remedies for pimples to get more tips! Honey is sticky while cinnamon is spicy. 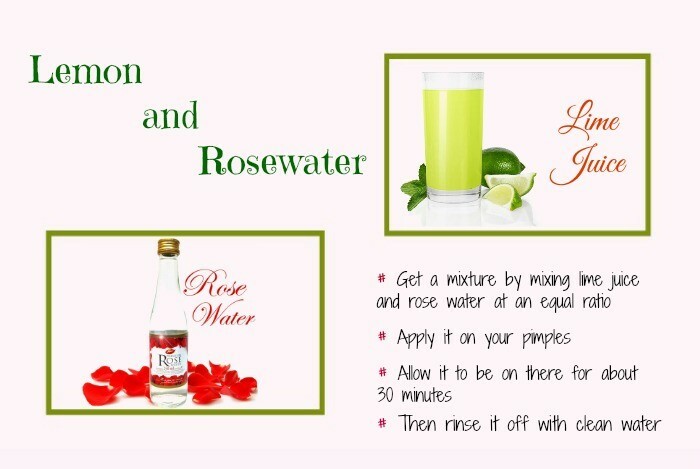 The combination of these two ingredients can help in getting rid of pimples. Cinnamon contains antimicrobial properties that can help in preventing bacteria from getting out of your hand. And honey is a natural antibiotic that is ready and waiting to clean the little buggers out. At first, you rinse your face with clean water and pat dry. Then you mix 2 tbsp of honey with 1 tsp of cinnamon together to get a fine paste. Next, you apply this paste to your face or affected areas and allow it to stay on there for 10 to 15 minutes. You wash off completely and pat the face dry. This is a sticky paste, so you have to make sure that you take some paper towels in your hand. Using egg white is an easy and affordable treatment to help in reducing pimples and fade scars that are caused by pimples. Egg whites are helpful for your skin because they contain full of proteins and vitamins. Both of them combat pimples and help in rebuilding your skin cells. They also eliminate the excess oil that means excess sebum on your skin. You just make sure to apply a good moisturizer after doing this process because they can make your skin dry out a bit. At first, you wash your face with clean water and pat dry. Then you separate 2 or 3 egg whites from the yolks. Next, you whisk the egg whites till they are frothy and then you let them in place for a few minutes. Now, you use the fingertips to rub the mixture on your face or problem spots. You should cover it by 3 to 4 layers. However, you have to make sure that you wait the first layer has dried before you apply another layer. You let the mask sit and dry for 20 minutes. Finally, you rinse off completely with lukewarm water and use a soft washcloth to pat dry. You should apply a suitable moisturizer for your skin type after doing this process. 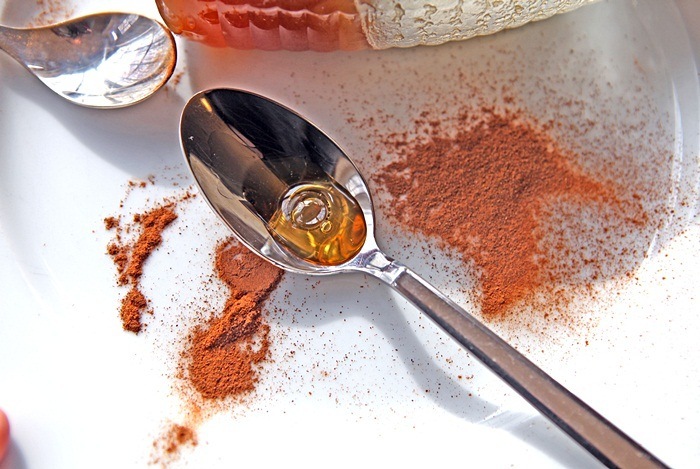 Using cinnamon is one of the simplest home remedies for pimples. 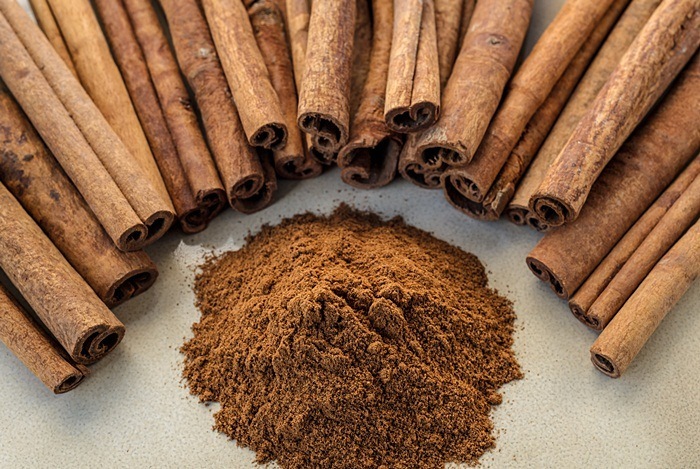 Cinnamon contains antimicrobial properties that will help in treating your pimples quickly. According to a study published in the International Journal of the Pharmaceutical Science Invention, using cinnamon helps to suppress or kill the Staphylococcus, E. coli, and Candida Albican microbes . It also contains astringent effects that help to shrink skin pores, making the skin appear smoother & softer. Another review found that cinnamon contains antimicrobial and wound-healing properties. The researchers suggested that using cinnamon may offer anti-aging effects on the skin . Firstly, you mix a little cinnamon powder with some drops of honey and gram flour in order to get a fine paste. Then you apply this paste on your face. Keep waiting for about 15 minutes until the paste becomes drying. At this time, you massage gently your face in a circular motion. It will eliminate all the dirt and oil that leave on your face and make your face smooth and glowing. As we know, turmeric contains the antibacterial, anti-septic, anti-cancer, anti-inflammatory, and other properties due to curcumin compound . These properties make turmeric become the most healing spice which may be used to treat pimples. Applying turmeric helps to eliminate the excess oil from the skin pores. Consuming turmeric aids in regulating the sebum secretion by inhibiting the activity of your sebaceous glands. 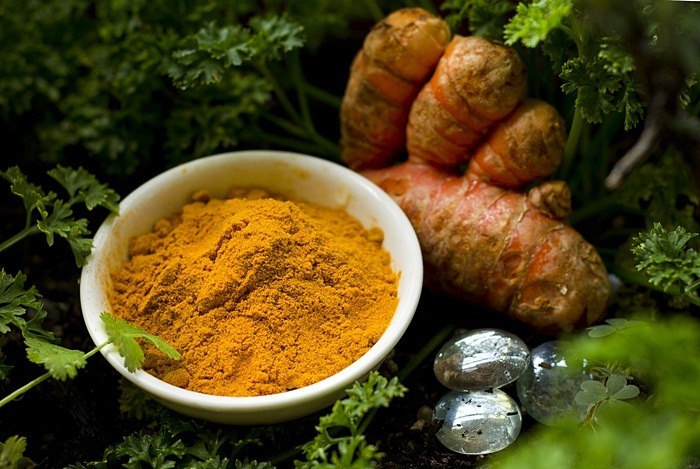 According to a study, curcumin in turmeric has positive effects on sebum secretion . Here are some home remedies for pimples using turmeric you can apply to get rid of pimples quickly. 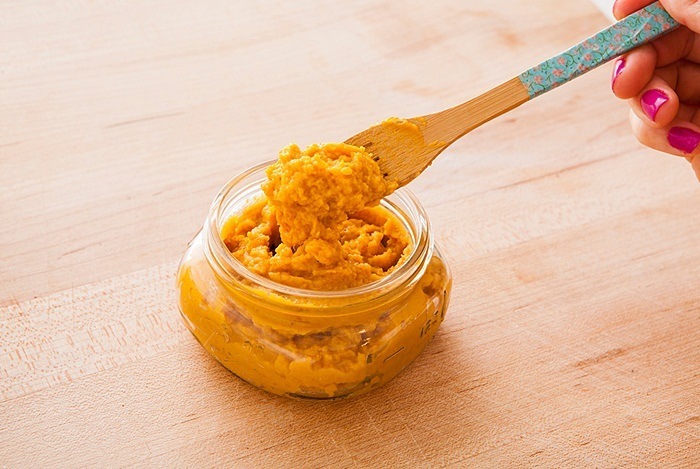 You make a fine paste by mixing some teaspoons of turmeric powder with a little water. Then you apply this paste on pimples. You should allow it on your face for about 5 to 10 minutes. Now, you wash off with lukewarm water. 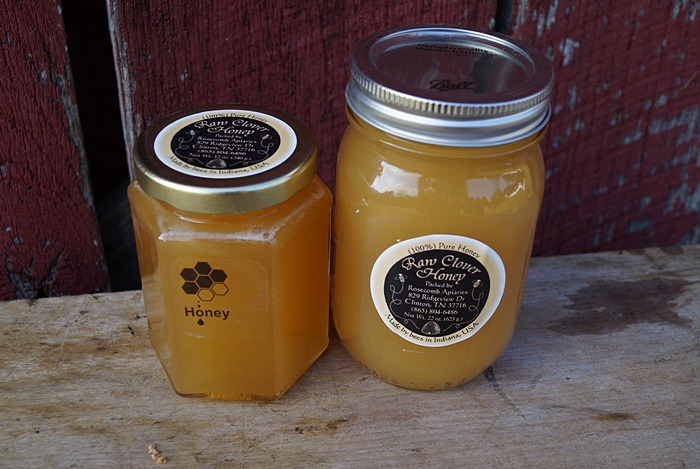 You may use honey to replace water for its antiseptic property. You mix turmeric powder with sandalwood powder at an equal ratio. Then you combine it with a little rose water to make a smooth paste. Next, you apply this paste directly on your pimples and wait for about 10 to 15 minutes. Finally, you wash off with lukewarm water. This process not only makes your pimples go away but also gives you a glowing skin. You extract some coriander leaves to get the juices. Then you grind a fresh turmeric and mix it with the juice make a fine paste. 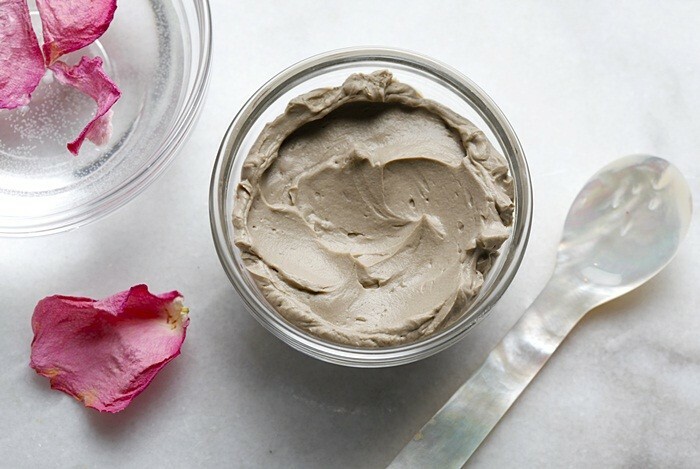 Now, you apply this paste to your pimples to eliminate them. You should repeat this process daily to get the best results. Note: Using turmeric may leave yellow spots on your face, pillow cover, your hands or any other place where you touch or sit on. Therefore, be careful when you use turmeric for healing your pimples. 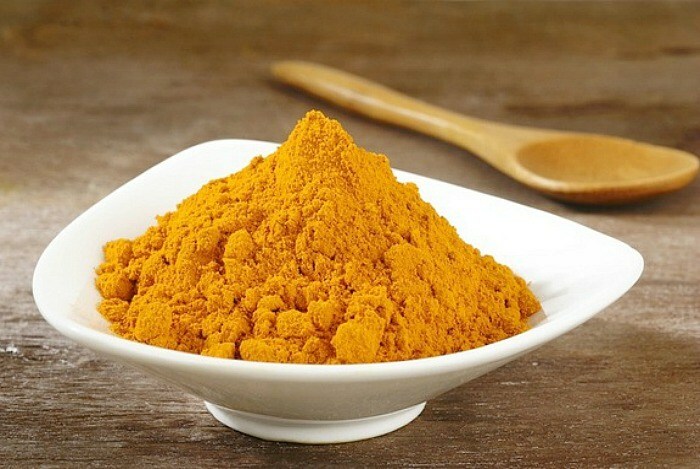 You do not allow turmeric to stay on your skin for a long time or you will have to be inside for a few days because the pale spots will leave on the skin! You should always rinse off turmeric with warm water to eliminate the spots. Fenugreek is one of many spices that can be used to treat hundreds of skin diseases including pimples. 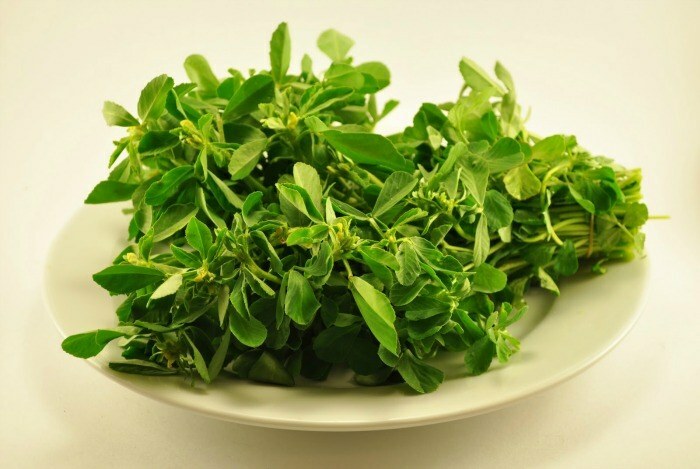 You may use fenugreek leaves or its seeds for your different purposes. 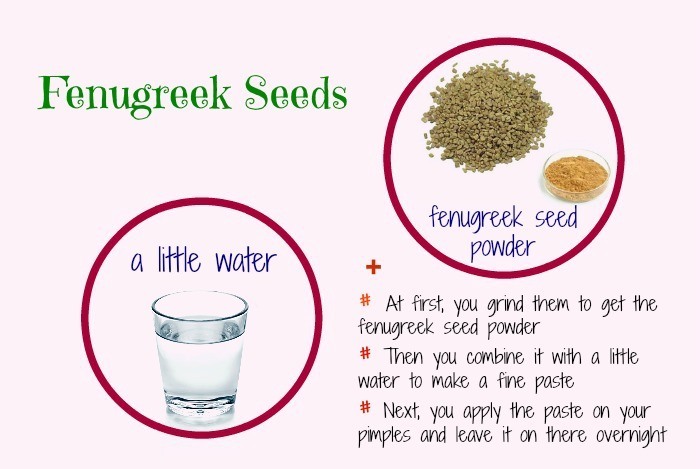 You can follow either of these home remedies for pimples using fenugreek to get rid of them. First of all, you crush some fenugreek leaves to make a fine paste. You can add a little water if required. Then you apply this paste directly on your pimples. Keep allowing it to stay on your pimples until it dries. After it dries up, you wash it off with clean water. At first, you grind them to get the fenugreek seed powder. Then you combine it with a little water to make a fine paste. Next, you apply the paste on your pimples and leave it on there overnight. You should repeat this process at least a week or more to get rid of pimples. 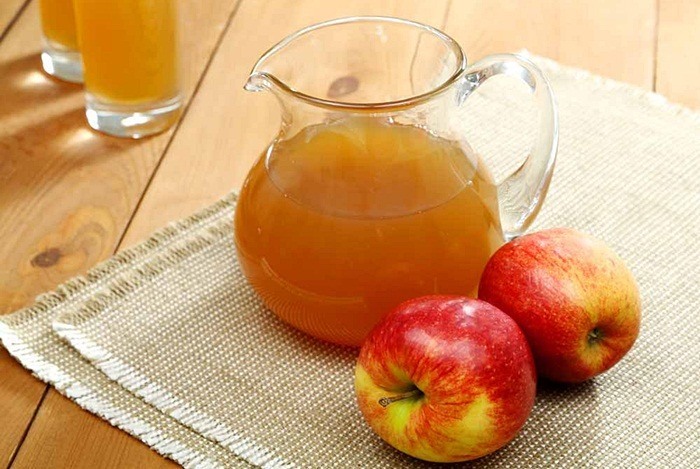 Apple cider vinegar can kill off the bacteria which may lead to all the troubles for your body. It contains acetic, lactic, succinic, and citric acid, all of which are very effective in killing P. acnes . According to a study, 22 people used lactic acid lotion on their faces twice per day for 1 year. Most of them reported a significant reduction in pimples & acne, while only 2 people reported an improvement less than 50% . It also has the ability to balance the pH of the skin and thereby making it harder for bacteria to thrive. Besides, using apple cider vinegar will help in drying up excess oil. However, you should avoid overdoing and drying out the skin too much. This may make the sebaceous glands work more to compensate and thereby triggering an outbreak. First of all, you rinse your face with clean water and pat dry. Then you mix apple cider vinegar with pure water at the ratio of 1:3. Next, you soak a cotton ball/clean cloth to the mixture and apply it directly to the affected areas. Keep allowing it to stay in place for about 10 minutes or overnight. You should apply this process several times a day and wash your face thoroughly afterward. Note: Remember to use a moisturizing cream after following this process, or when you feel that your skin is getting dry. It seems that using milk can improve the outbreaks and your skin tone. The reason for why using milk leads to pimples is due to the extra hormones in it. However, this seems to happen when you ingest milk directly. When you use it externally, it just soothes your skin and aids in toning down the redness of your skin. In another way, you can also use yogurt in order to eliminate pimples and their scars. The acids in yogurt are antibacterial that can help you to get rid of bacteria on your skin while the fat can provide moisture and make your skin healthy. 1 tablespoon of plain milk/yogurt. At first, you let milk/yogurt be at room temperature (or close to) so that you do not get a chilly shock when putting it on your skin. 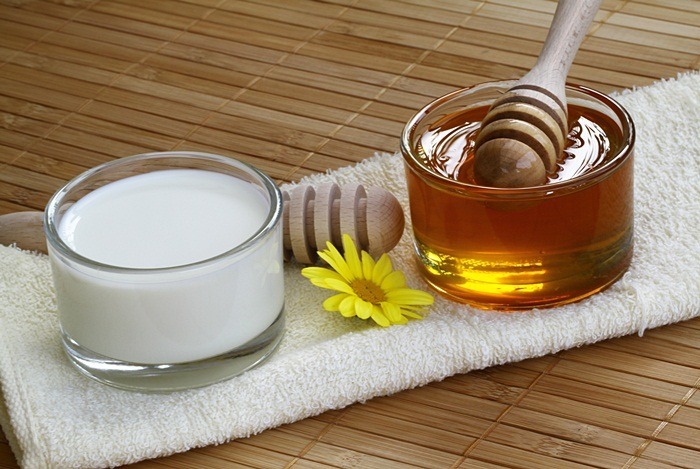 Then you mix 1 tablespoon of milk/yogurt thoroughly with 1 tablespoon of raw honey. Next, you soak a cotton pad to this mixture, rub and pat it on your face. You let each of layers dry before rubbing a new layer till the mask is thick as you want. Keep allowing this mask to stay on your face for 10 to 15 minutes. Finally, you rinse your mask off with clean water and use a washcloth to pat dry. You should moisturize your skin as usual whenever you finish this process. Keep following this writing about natural home remedies for pimples to have more information! Pimples that are caused by dead skin cells/extra oil and bacteria clogging up your pores can improve by using orange peel face mask. Because orange peel contains a large amount of citric acid, astringent properties, and vitamin C. Vitamin C is particularly beneficial in promoting the growth of your new healthy cells and keeping the skin in better condition overall. First of all, you wash your face with fresh water and pat dry. Then you take the peels of 2 oranges and grind it by using mortar and pestle or a blender. Next, you combine it with a little water to make a fine paste. Now, you apply this paste directly to your face or problem areas. Keep waiting for about 20 to 25 minutes. Finally, you rinse off completely with clean water and use a towel to pat your face dry. You should use a moisturizing cream afterward. 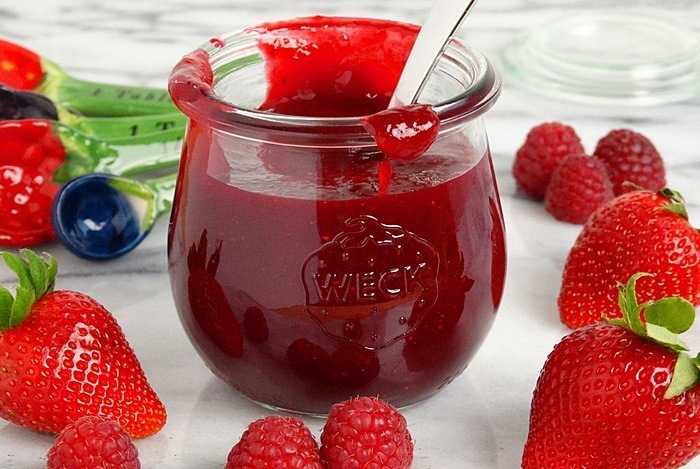 Using a mixture of honey and strawberries is one of the wonderful home remedies for pimples. Strawberries are high in salicylic acid. In fact, salicylic acid is a primary ingredient in many acne treatments. It encourages your epidermis to shed the cells more readily, opens up the clogged pores, and neutralizes bacteria. In addition, it also shrinks up your pores. That can prevent your pores from clogging up too much in the future and stimulate the new cell growth. While honey is anti-inflammatory and acts against bacteria which may be the reason causing your pimples. Next, you wash 3 strawberries and then you grind them well. You should take care that they do not get over mashed and runny. Now, you combine it with 2 teaspoons of raw honey and thoroughly mix them together to get a fine paste. You apply this paste to your face and allow this paste to sit in place for about 20 minutes. Finally, you rinse off completely with lukewarm water and pat dry. You should moisturize if your skin becomes dry. Apply this process twice a week during at least a month to have the best results. Aloe vera gel may be combined with many other things to fight pimples. However, it is the best when using it without mixing anything. It is wonderful if you have some aloe vera plants grown in your house. Aloe vera not only helps you in soothing, it also acts as an anti-inflammatory to help in decreasing redness and swelling. Besides, it has antibacterial properties to eliminate the dead skin cells. 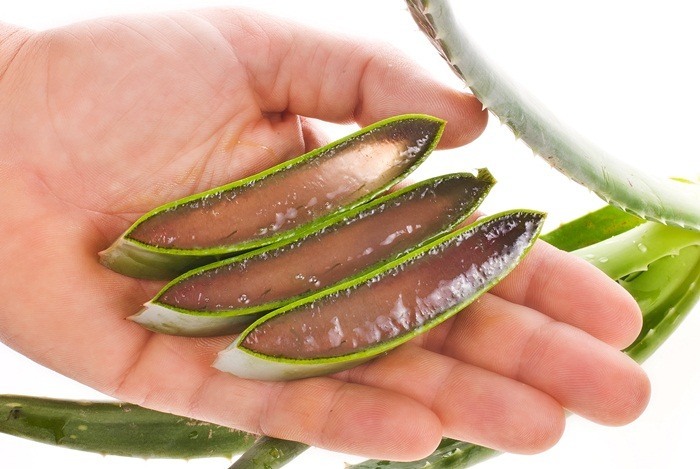 According to a study in the Journal of Annals of Plastic Surgery, a topical application of the gel of aloe vera may help to speed up the healing process of wounds on the skin . First of all, you wash your face with clean water and pat dry. Next, you extract some aloe vera leaves to get its gel. Then you use your fingertips to apply the aloe vera gel directly on your problem areas. Keep waiting for 15 to 20 minutes and rinse off with clean water. You should do this process daily until you have the improvement. 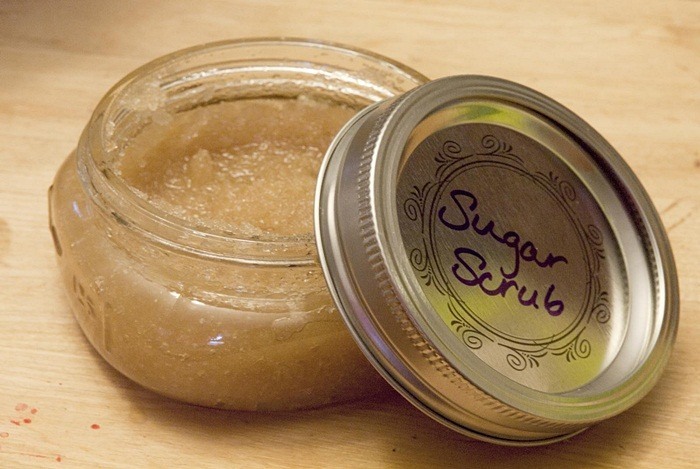 White or brown sugar can help you to eliminate the excess skin cells that clog up your pores. Just combine it with olive oil, honey, or plain water and you may have a sweet mixture to help in getting rid of your pimples. Here is one of the home remedies for pimples by using sugar you can follow to treat pimples. At first, you mix 1 ½ cups of white sugar with 1 ½ cups of brown sugar. Next, you combine it with 2 or 3 tablespoons of crude sea salt for the extra exfoliation and mix well. Then you place about 2 cups of this mixture into a bowl. You add the virgin olive oil to the bowl and allow it to soak through a half of the mixture. After that, you mix it well in the bowl, and then you add it to the rest of the mixture. You continue to add 4 or 5 tablespoons of fresh vanilla extract and mix it well. Now you place this mixture into a bottle to store it. You apply this mixture to your affected areas. Keep allowing it to stay in place for about 15 minutes and rinse off with clean water. 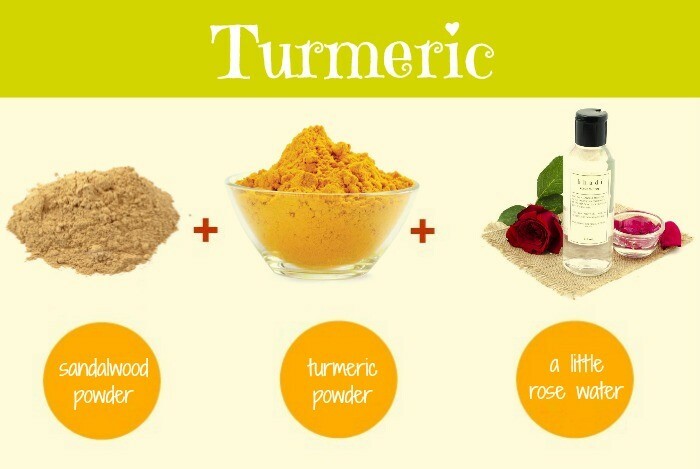 You should use this mixture regularly to eliminate pimples quickly. 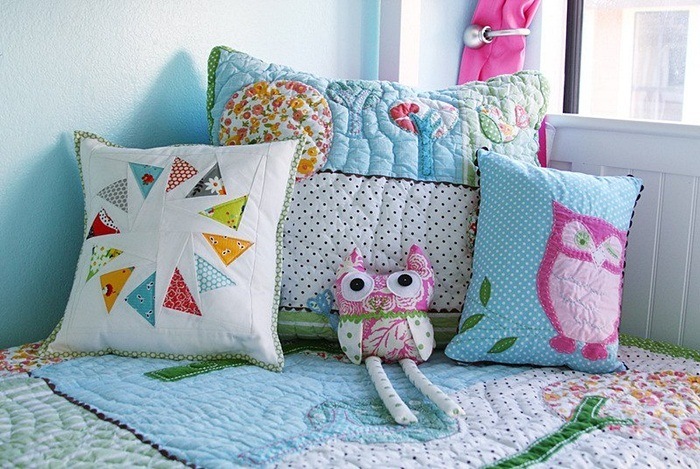 Technically, you should wash your pillowcase at least once a week. However, most of us do not practice this. If you never wash your pillowcase, all the stuff which gets rubbed into it then contact with your face for about 6-8 hours every night and makes your pimple problem more serious. You should keep a clean and comfortable place to rest your head and you will protect your face from bacteria. Next, you grind some fresh mint leaves thoroughly by using a blender. Then you rub it directly on your face. Keep allowing it to stay for about 5 to 10 minutes before washing off thoroughly with cold water. You should repeat this process regularly until you get rid of pimples. EGCG that was shown to decrease sebum production, bacterial growth, and inflammation of your skin . 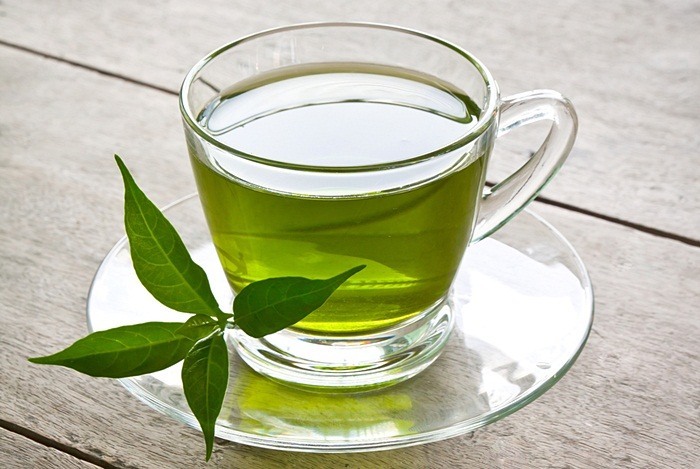 Here is one of the home remedies for pimples by using green tea you can apply to treat pimples on your skin. 1 green tea bag or 2 teaspoons of loose organic tea leaves. First of all, you have to rinse your face with clean water and pat dry by using a soft clean towel. Then you pour boiling water over 2 teaspoons of loose organic tea leaves or 1 green tea bag put in a clean bowl. You steep for about 4-5 minutes and then you strain the leaves and let the water cool down at a comfortable temperature. Now, you put this water in a spray bottle and lightly spritz your face. You should rinse your face with clean water after you do this process. Potato is a great vegetable for treating pimples. 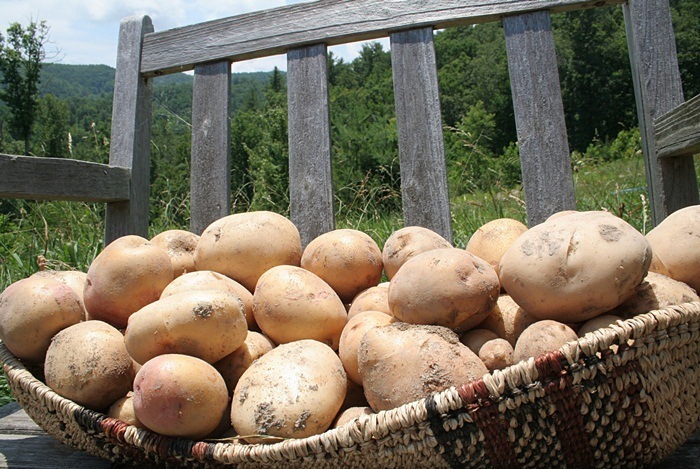 Potato contains a large amount of potassium, phosphorus, sulfur, and chloride. All components in it can help in reducing pimples and bothersome blemishes. 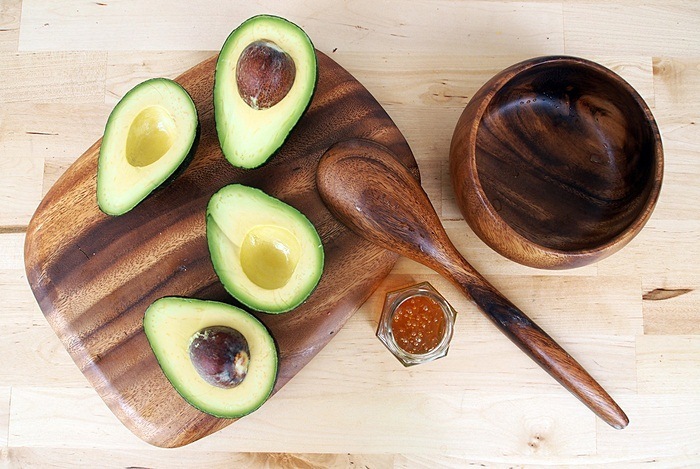 It also contains antioxidants that nourish your skin and stimulate the healthy growth of your new skin cells. Of course, first of all, you have to rinse your face with clean water and pat dry. Now you grind 1 raw potato and it directly on your face. You should wait for a few minutes in order to let it dry. And then you rinse off completely with lukewarm water. This is very simple to apply. You should do it daily to have the best results. Firstly, you rinse your face with clean water and pat dry. Now, you scrap out the peel of the avocado and mash it up. Next, you apply it directly on your skin and let it stay for 15 to 20 minutes. Finally, you wash off your skin with lukewarm water and pat dry. You may apply moisturizer depending on your skin type. There are many other natural home remedies for pimples presented in the next part of this writing, so keep reading it to discover more! 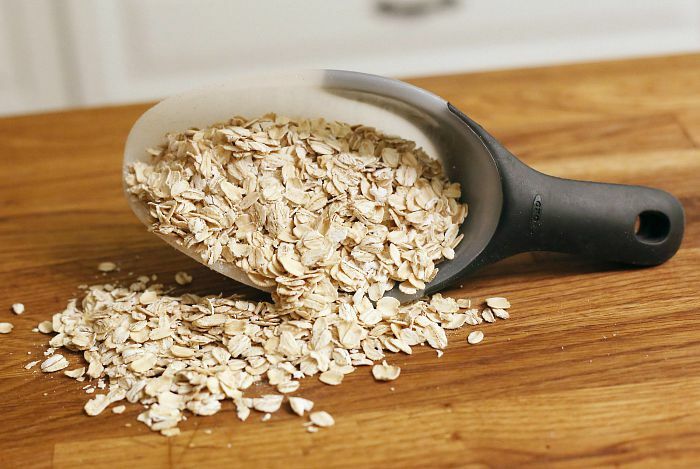 If you soak or cook oatmeal powder and use it like a mask, it can help you to decrease the inflammation & unsightly redness that accompany with breakouts. You add a little honey to oatmeal in order to make a mask and you will have a wonderful treatment for healing pimples. Remember that only using oatmeal will not help you to cure your pimples, thereby you should combine it with honey for removing pimples quickly. According to a report in the Indian Journal of Dermatology, Venereology, & Leprology, oatmeal contains various antioxidant & anti-inflammatory effects. The report found that oatmeal may help to treat pimples, acne, and other skin conditions . At first, you mix some teaspoons of oatmeal powder with boiling water. While it is still hot, you add 2 tablespoons of raw honey. You leave it in place for 20 to 30 minutes and rinse off with lukewarm water. This is one of the simple and effective home remedies for pimples. Steam can help in soothing a number of minor diseases including pimples. By opening up your pores and eliminating impurities that are lurking deep in your skin, steam helps in reducing pimples, and their glaring appearance. You can choose to apply only steam, or you may use something afterward. 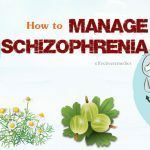 At first, you boil a pot of water and put it into a large bowl. You allow it to cool for a few minutes. After the temperature has lowered slightly, you put your face above this bowl and drape a towel over the head in order to trap the steam. You should remove the towel after 10 to 15 minutes and pat your face dry. Keep doing this process once a day or as you need. Fuller’s earth is also known as Multani mitti that is useful for greasy skin and pimple because it absorbs excess oil and opens your pores. 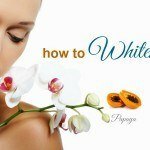 It also helps in improving your complexion. First of all, you mix fuller’s earth (multani mitti), sandalwood powder and rose water at an equal ratio. Then you apply the mud pack on your face. After it dries, you wash your face with clean water. You should repeat this process once a week. 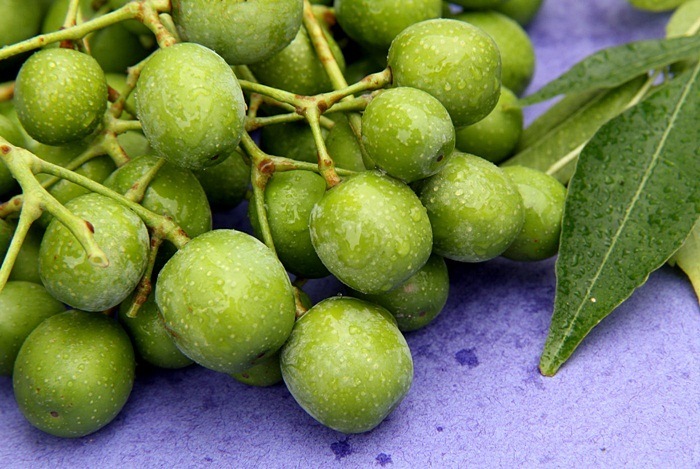 It is also known as neem that may be used for healing many various skin problems. It has antiseptic and antimicrobial properties which can help in killing the bacteria causing pimples. Besides, it can soothe the redness & inflammation of your skin. Firstly, you grind some Indian lilac leaves and mix them with a little water to get a fine paste. Then you combine it with some teaspoon of turmeric powder. Next, you apply it directly to your affected area. Keep waiting for about 20 minutes and wash it off with clean water. You should do this process at least 2 times a week. You may also apply Indian lilac oil several times a day till you see the improvement.  If you want to know more about natural, at home remedies for other diseases and conditions, go to our main Effective Remedies page. After reading the article of 36 most effective home remedies for pimples on scalp, face, and back that work naturally, hope that it can help you find out the best solution to get rid of pimples quickly and easily.